Treyvon Martin was killed by a white guy named Zimmerman, in one of those gated communities in Florida where people live in fear. 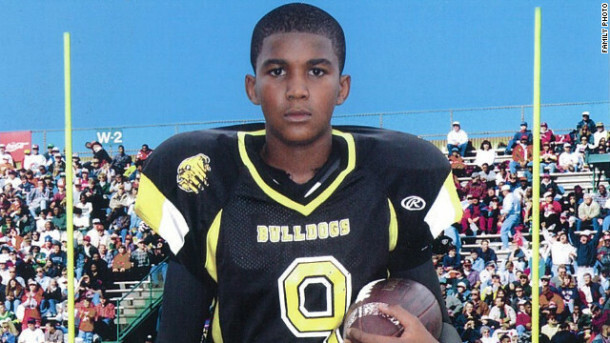 He was killed because he was a black kid wearing a hoodie, at night, and for this he looked “suspicious” enough. Zimmerman was some kind of self-appointed “neighborhood watch”. Martin was not armed. Martin was returning from the store with skittles. Zimmerman is still free. I have family in Florida. My folks were born there. My uncle used to pick us up from the airport and slyly inform us he had a gun in the glove compartment because it’s dangerous in Miami. When he talked about “those people will get you right at the intersections, stopped for a light” we understood what he meant. My uncle, thank god, never did anything crazy like Zimmerman, and his gun carrying days are over, at least I think. I also know he liked the badass-ness of carrying a weapon. We loved him and still do. Going back even further, my mom went to the Univ. of Florida, 1957-58. There were no black students at that time. The school mascot, Albert the Alligator was often spotted walking across the lawn in front of her dorm. Alligators allowed on campus, no blacks. All my visits to Miami I remember feeling peoples fear. Doors locked, we drove everywhere, we didin’t walk down certain streets, in certain neighborhoods- the white people I travelled among lived in a fantasy bubble of people just like themselves. Most of them being Jews, this seemd extra sad. Black sheep scapegoating others. The feared and hated, hating and fearing . To hear these rich Jewish teens, friends of my cousin, warn me not to go to Ni***ertown was nauseating. I guess my circles haven’t changed because no one I know is talking about Treyvon Martin. Maybe they are and I just don’t get out much. Treyvon Martin, I wish you hadn’t lived in Florida, but then again I don’t know if you would have been any safer here in Berkeley. I’d like to think so. You have a kind face, and I wish you’d never worn a hoodie over it. I wish the wearing of a hoodie wasn’t an excuse to shoot someone in 2012 that seems to work well enough with the Law. I wish the kids I teach in high school were talking about you, were demonstrating about you, were doing something. Some things are too fucked up even for Zamboni to handle I guess. Posted on March 26, 2012 March 26, 2012 by ZambonesmanPosted in jordan posts, UncategorizedTagged RIP, Treyvon Martin. Previous Previous post: Dear Zamboni, who’s texting me?